RPC Barrier Containers has developed a long shelf life ambient packaging solution for a range of ready meals produced by French foodservice specialist Soulié Restauration, part of the William Saurin Group.The 600ml oval tubs are thermoformed in multilayer polypropylene by RPC Bebo Plastik, with the matching lids injection moulded in PP by RPC Bramlage. The barrier pack provides a shelf life of up to 18 months for the ready-to-heat typical French recipes. 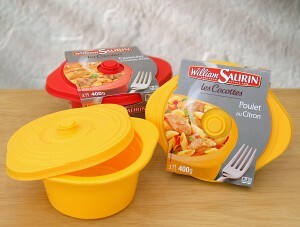 The custom-designed tub and lid have been created to resemble a traditional casserole pot and are coloured red or yellow depending on the product. The eye-catching colours and innovative design helped to create on-shelf impact and brand differentiation in a highly competitive market sector.The ready meals are retorted in the tub after filling. The technical skills and close co-operation between the two RPC sites help to ensure that the lid remains closely fitting after the retort process.